A basketball rivalry could be re-emerging on the West Coast, due mostly to Steve Alford being in his second season at UCLA. Alford has coached against UNLV for several years, and he will again today, when the Bruins host the Rebels in a closed scrimmage at Pauley Pavilion. NCAA rules prohibit the media and public from attending. Coaches and players are not even allowed to comment to the media and acknowledge a specific opponent, turning these widespread scrimmages into supposed top-secret operations. Why such a mandate from the NCAA? No one has the answer. So, while UNLV coach Dave Rice did not discuss details of the scrimmage, he did reference it in vague terms. “I felt like it was important to play a scrimmage against a Top 25-type of team and do it on the road,” Rice said. “Six of our top 10 scholarship players have never played a Division I basketball game, so it will be a huge benefit to us. 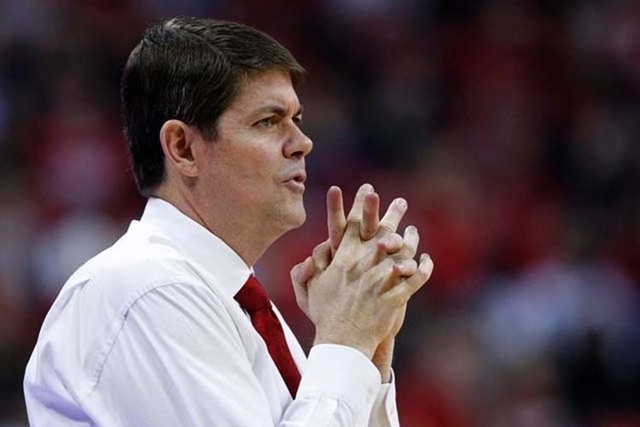 Rice and Alford, formerly the New Mexico coach, have a close relationship from their years as rivals in the Mountain West. Ryan Miller, in his first season as a Rebels assistant coach, served on Alford’s staff with the Lobos. The connections are strong enough that UNLV and UCLA might soon schedule a series in the regular season. The teams last met in December 1998, when the Bruins beat the Rebels 72-67 in Los Angeles. UNLV and UCLA could meet next season, as both teams are in the 2015 Maui Invitational with Kansas and Indiana. The Rebels will face four Pacific-12 Conference opponents — Arizona, Arizona State, Stanford and Utah — on their schedule this season. In its only exhibition, UNLV routed Florida National 100-65 on Wednesday. After the game, sophomore forward Chris Wood was asked about playing UCLA in a scrimmage. “Who? I’m not sure who we’re playing,” Wood said, obeying NCAA rules by feigning no knowledge of today’s scrimmage. The Rebels open the regular season against Morehead State on Friday at the Thomas &Mack Center.